A retreat, dream home, investment property or; maybe, you have something else in mind! Imagine 2 luxury log homes for sale in Canada on an acreage along one of the most beautiful lakefront and within one of the most majestic valleys in the world! Imagine no further because this property for sale that includes all the above! If you are looking for a retreat, this is an exceptional property! Located in one of the most beautiful areas of the World in Southern BC Canada, this property has everything you’d want in a personal or business retreat or lifestyle property for peacefulness and re-energizing. Just Relax. From this property it is so easy to relax. From a room, be lazy and enjoy the views. Get out on a deck for a sun bath. Listen to nature. Look out towards the ever impressive views of the lake and mountains from a lounger or hammock! In the evening, relax to a glass of wine in the hot tub and look out to the stars! As a retreat this is amazing! It’s not a private lake for sale in BC, but hold on for a minute as this might be something much more desired! The Kootenay Lake and the mountains around this property make it perfect for a range of activity for all ages. If you like water sports there is plenty of lake at around 100 km long by 4 km wide; that’s a lot of space to explore! 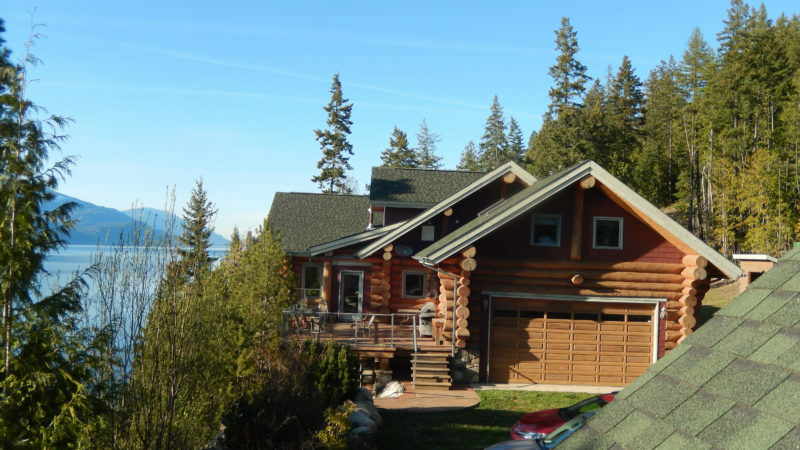 When it comes to a BC log home for sale, often people think of private lakes for sale in BC. Even though this is not a private lake, it kinda feels like it because the views and location are as if you had your own private lake in BC. On shore, this part of the Kootenay region has wonderful low lying valley areas and has two mountain ranges East and West in the distance. There are four seasons too with some of the nicest climates in Canada. If you like a few snowflakes or Canada’s most envied fall colors, you have come to the right place. This enables a ton of favorite activities for all ages. If you like photography this would be a dream come true from its amazing landscapes to wild flowers and wildlife. Go cross country skiing around many community developed trails. Like down-hill skiing. You are in one of the best skiing locations in the world. Like mountain biking, or hiking; pick any direction. This has all the makings of a lifestyle property! And then, for day trips, there are so many things to explore. There are several nearby towns to explore to connect with the community. Nelson is a vibrant town with a highly successful entrepreneurial environment. From here, you can explore exciting shops and local events. Too, the famous movie Roxanne with Steve Martin was filmed nearby! Just minutes away from the property is the town of Crawfort and Kootenay Bay. It’s a really nice community with local shops and annual events. The entire area draws in visitors from around the world; who wouldn’t want to come to such a dreamy location and to think that you could own a part of this! In the bigger picture, this area is also in close proximity to the Okanogan, the East Kootenay valley and the USA. It is a great hub for many interests. From the point of view of investment properties, if you are looking for an acreage for sale in BC, there’s lot of value to consider. The total land for sale is 27 acres and much of this is not developed. There is also a lot of timber value on the property as well. About 12 acres are developed. Current property development includes two luxury log homes fully equipped. These homes are fully serviced and have been setup for income properties and, from an investment perspective many different income streams could be applied with this size of acreage and given its location. This property has many benefits for best real estate investments. When it comes to acreages for sale in BC, this is 27 acres that offers a unique bundle of opportunities given the geography and overall layout! You could do many different things with the acreage from having a hobby farm, cabin rentals, a business retreat, some form of health and wellness business or even a resort! The creativity doesn’t have to stop there. What are some things you’d consider for property use? Many things could come to mind as an investment, but then again, maybe you just want to run your home business from here, retire and write books and have a second place for visitors within these wonderful country homes! 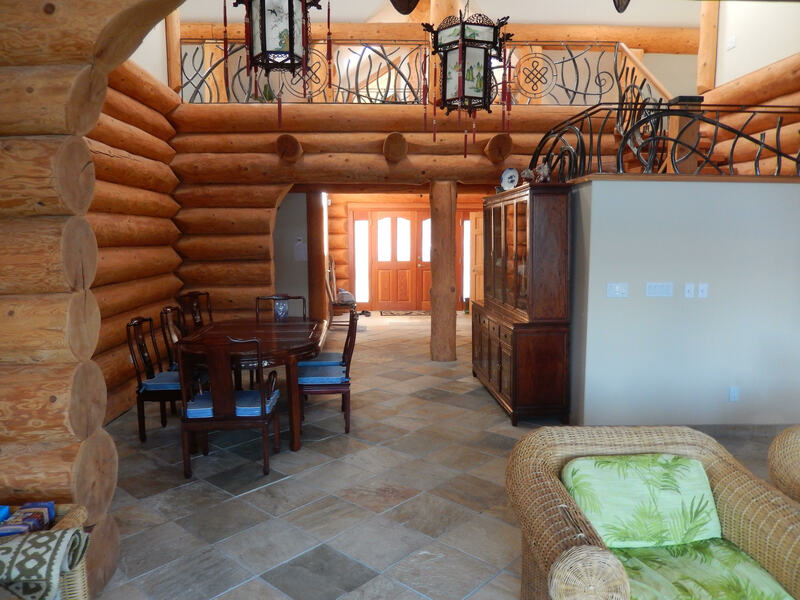 The first home you arrive to on location is the most prestigious luxury log home. It is three levels and around 7000 square feet of luxury home. It is built with premium custom built logs and modern design and features high end rockery and tile works – if you are less experienced with these types of properties, its designs are intriguing, simple and rewarding: Learn more facts about log homes! This country home has 6 bedrooms with a modern cozy country feel. Bedrooms in this home invite the wonderful views of the lakefront complimented with evergreens. This home also has heated flooring! Throughout the home, there is a large kitchen area with common areas and dinning, a recreational room. High end cabinets and counter top material have been added and some very attractive custom decor can be envied throughout. The deck wraps around the home for mountain and lakefront views. During social times, there is also a barbecue area and a hot tub for chilling out. Further into the property, there is a second country home. Its house design combines contemporary and log design. This home has 2600 square feet of living space. There are 3 bedroom and 2 bathrooms within two floors. Each bedroom room is nicely designed with modern country home design and log features. Common areas are an open concept perfect for cooking, social and dinning. Flooring is also heated in this home. From the inside and out, the lakefront home views are spectacular. Step outside to the wraparound deck and you can relax also to the ambiance of nature and lakefront mountainous views. If you are looking for a retreat or dream home, investment properties, or some other combination you may have in mind for having a country property on acreage, this property has many values and benefits and may be among rare finds given location and potentials! Would you or someone your know be interested in this property? Contact us below … or share this property! Hey everyone, if you like property topics and learning about different home designs like these BC log homes, keep reading… click here to see different home designs, property types and useful topics for a range of homes interest.